It is that time of the year when people are encouraged to leave their homes and journey. Final examinations in most educational institutions are or will be over very soon and the families take this opportunity to throw away their boredom with trips. When everyone decides to pack their bags, the logical outcome is a severe scarcity of tickets. 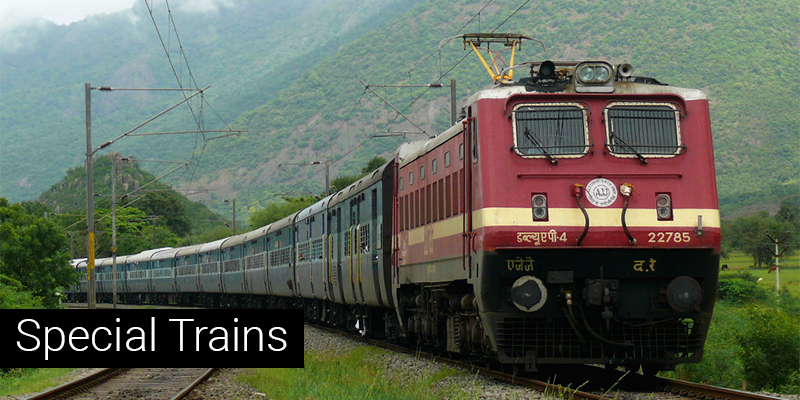 Keeping this in mind, Indian railways have decided to run 144 special trains to various destinations. Days of running: Train will run on all Wednesdays from April 6-June 22. Will be available on April 6, 13, 20, 27, May 4, 11, 18, 25, and June 1, 8, 15 and 22. Days of running: Train will run on all Fridays from April 8-June 24. Will be available on April 8, 15, 22, 29, May 6, 13, 20, 27 and June 3, 10, 17 and 24. Stoppages Enroute: Bargarh Road, Bolangir, Titlagarh, Kesinga, Raygada, Visakhapatnam, Vijayawada, Gudur, Renigunta, Jolarpetai and Krishnarajapuram stations in both the directions. Days of running: Train will run on all Wednesdays and Saturdays from April 6-June 25. Will be available on April 6, 9, 13, 16, 20, 23, 27, 30, May 4, 7, 11, 14, 18, 21, 25, 28 and June 1, 4, 8, 11, 15, 18, 22 and 25. Days of running: Train will run on all Fridays and Mondays from April 8-June27. Will be available on April 8, 11, 15, 18, 22, 25, 29, May 2, 6, 9, 13, 16, 20, 23, 27, 30 and June 3, 6, 10, 13, 17, 20, 24 and 27. Days of running: Train will run on all Tuesdays and Fridays from April 5-June 24. Will be available on April 5, 8, 12, 15, 19, 22, 26, 29, May 3, 6, 10, 13, 17, 20, 24, 27, 31 and June 3, 7, 10, 14, 17, 21 and 24. Days of running: Train will run on all Wednesdays and Saturdays from April 6-June 25. Will be available on April 6, 9, 13, 16, 20, 23, 27, 30, May 4, 7, 11, 14, 18, 21, 25, 28, June 1, 4, 8, 11, 15, 18, 22 and 25. Days of running: Train will run on all Sundays from April 3-June 26. Will available on April 3, 10, 17, 24, May 1, 8, 15, 22, 29 and June 5, 12, 19 and 26. Days of running: Train will run on all Wednesdays from April 6-June 29. Will be available on April 6, 13, 20, 27, May 4, 11, 18, 25 and June 1, 8, 15, 22 and 29. Stoppages Enroute: Kollam, Kayankulam, Chengannur, Tiruvalla, Kottayam, Ernakulam, Aluva, Thrisur, Palakkad, Podanur, Tiruppur, Erode, Salem, Jolarpettai, Katpadi, Arakkonam, , Perambur, Gudur, Nellore, Ongole, Tenali, New Guntur, Vijayawada, Eluru, Rajahmundry, Samalkot, Duvvada, Visakhapatnam, Vizianagaram, Sri Kakulam Rd, Palasa, Brahmapur, Khurda Rd, Bhubaneswar, Cuttack, Bhadrak, Balasore, Hijili, Midnapore, Bankura, Adra, Asansol, Durgapur, Rampurhat, Malda Town, Barsoi, Kishanganj, New Jalpaiguri, Dhupguri, New Coochbehar, New Alipurduar, Koarajhah, New Bongaigaon, Goalpara Town and Kamakya stations in both the directions. RailYatri.in is an independent organization not related or working with Indian Railways. Thank you very much for sharing this valuable information !! plzzzz start a train from Sri Ganganagar to Ramnagar via Moradabad…. … plzzzzz sir do this .. Apka bhut dhanywad hoga…. pehle trial le lejiye sir agar passenger adhik huye to parmanent kr dijiyega train ko..
RailYatri.in is an independent body, not related or working with Indian Railways. Their are no special trains from secunderabad or hyderabad to guwhati. If the app adds two more option’s online booking and the availability of all trains. Instead availability between station’s.